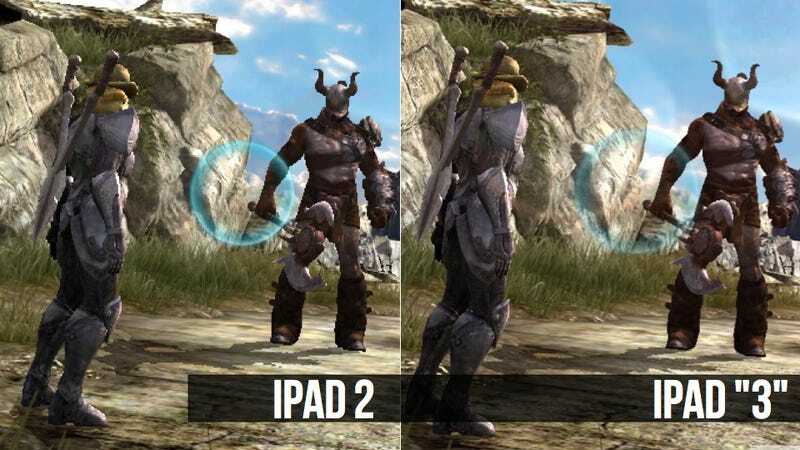 We've seen what top iPad game Infinity Blade II looks like on the new super-high-res iPad 3. But we're been looking for a comparison. Enter Kotaku reader Alsandair, who has the new iPad and sent us two shots of essentially the same scene. There isn't a dramatic difference, possibly because all the IB2 developers have done so far is boosted the game's graphics. Slightly more specifically, a spokesperson for the game's developers at Epic Games' Chair Entertainment says, "The new hardware enables Infinity Blade II to begin taking advantage of increased memory and processing power, yielding even higher performance and more sophisticated rendering features." They're not yet tapping the impressive muscle of the new machine to really boost the game. This is a simpler visual boost and a fairly subtle one. Click each shot to enlarge, and you'll get see the differences more clearly. Mostly, the iPad 3 version has fewer jagged edges, which is nice. The people making this game are on the cutting edge of pushing iPad tech, so expect to see more updates either in IB2 or in future Chair/Epic titles that eventually show what the new iPad really is capable of.